Even if today’s college students live to be 100 years old, more than half of the CO2 released into the atmosphere during the four years they are in college will still be present there at the end of their lives – warming the planet and contributing to extreme events, like droughts, floods, and storms all the while – long after the decision makers behind those investment choices will have left office. The college students across the US who are arguing that their education should not be funded by actions that diminish the health of the world in which their future will unfold have a strong case, supported by the basic physics of the climate. The New York Times has a front page article about the growing number of student-led campaigns at colleges and universities across the US calling on board’s of trustees to divest of investments in fossil energy companies. According to the article, some college administrations are listening to the students and taking steps to eliminate fossil fuel companies from their investment portfolios. Others are, so far, not agreeing with the link the students are making: that fossil fuel investment undermines the very future colleges and universities seek to prepare young people for. Just how long will the fossil fuel related decisions made by college Presidents and Board of Trustees today continue to impact the lives of current students? If a trustee supporting the inclusion of fossil fuel investments in a university’s portfolio today serves for 10 additional years, at the time he or she leaves the board, more than 95% of the CO2 released into the atmosphere during our hypothetical college student’s four-year education will still be in the atmosphere. By the time today’s college students are middle-aged, 82% of the CO2 released during their education will still be in the atmosphere. Much of the fraction that has ‘disappeared’ from the atmosphere will have been dissolved in the oceans, increasing ocean pH and upsetting ocean food webs. 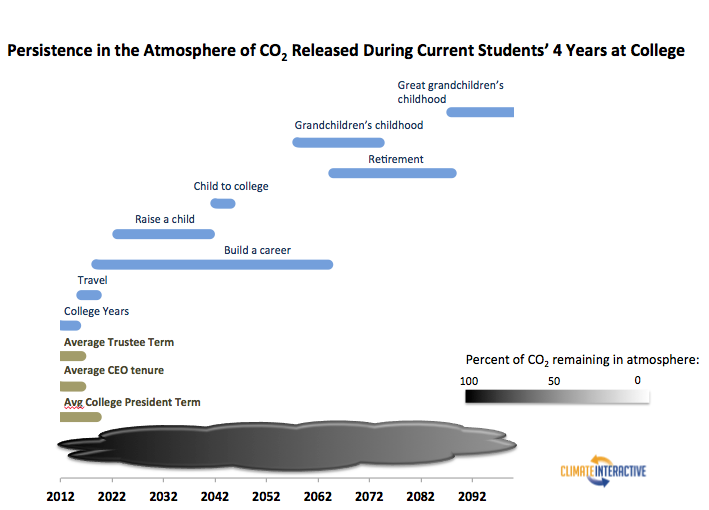 By the time a 55 year old college president who insists today that a portfolio requires fossil fuel investment reaches the age of retirement, only 11% of the CO2 released during the class of 2016’s education will have left the atmosphere. If the first rule of ethics is that those who are impacted by decisions should have some say in the decision, then the basics of the climate system make the case: college and university administrations should consult closely with their student body before including fossil energy companies in their investment portfolios. If you are a college student involved in a divestment campaign, we hope you can bring this analysis into your education and outreach, and into your conversations with those making your school’s investment decisions. Turn the graphic above into an interactive graphic, sharable via Facebook, and customizable, so that students could personalize their own timeline on the graphic or insert the names and expected terms of key college administrators, to make a version of the graphic specific for their college or university. Share analysis from our En-ROADs global energy model which shows the essential and immediate need for reductions in fossil fuel energy if the goal of limiting temperature increase to 2°C is to be kept in reach.